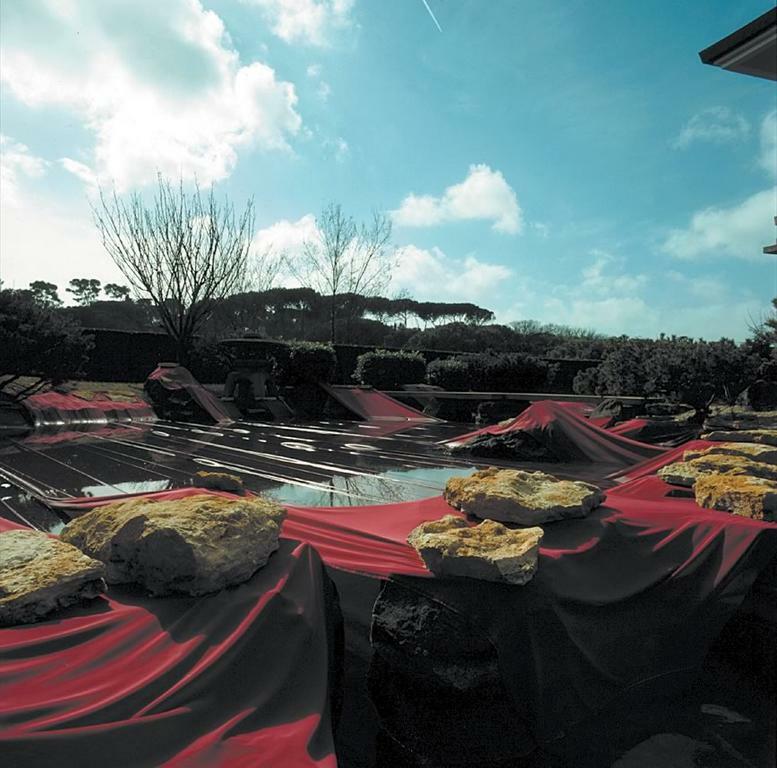 Materials: travertine, textiles, red earth, dried roses, rope, perfumed essence of peppermint. m 37 x 1,6 (Garden). 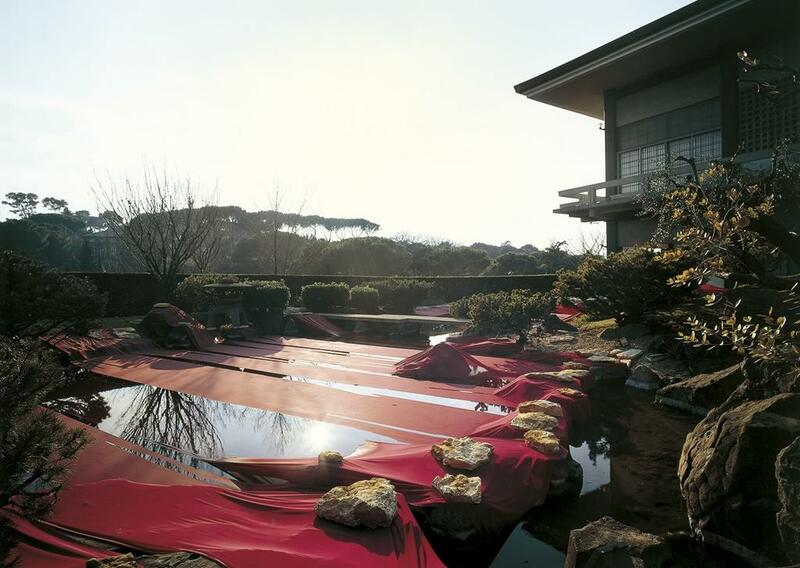 Nakiri, a Japanese coastal village near the Bay of Kashikojima where the women work in the traditional crafts of drying fish and seaweed, is the inspiration for the intense incursion of Maria Dompè in the spaces of the Japanese Cultural Institute of Rome. 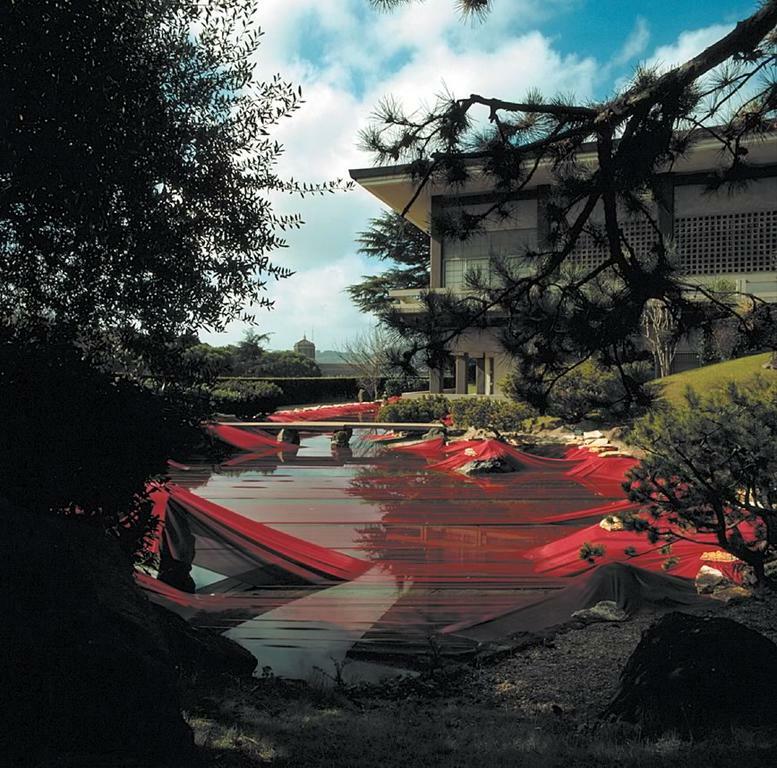 In the pond of the garden, the sculptress spread out long strips of dark red material that rise along the shore, where they are held by slabs of travertine and where they create a strong chromatic contrast with the green of the water and of the vegetation. 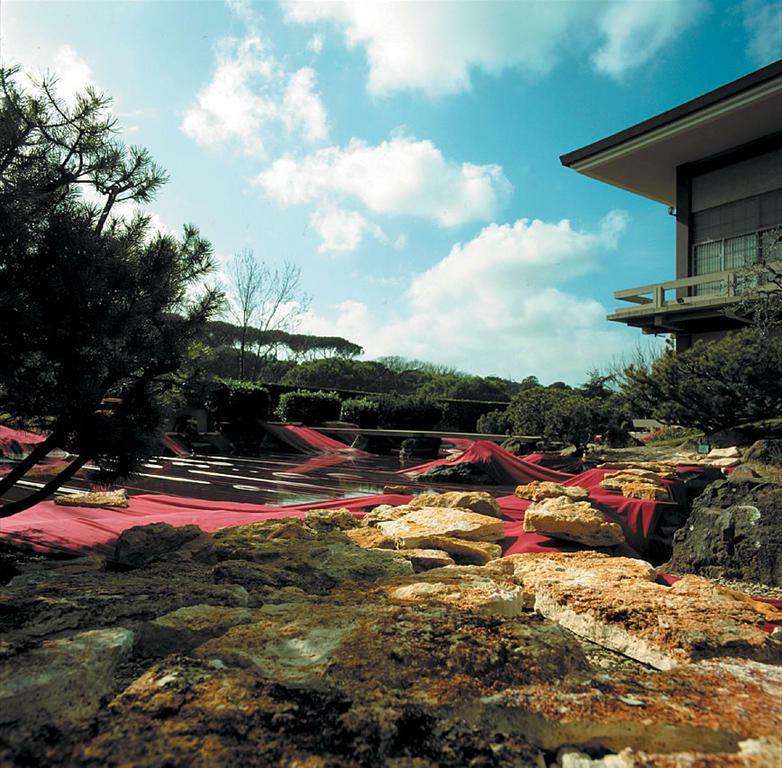 Inside, on a sort of terrace of rough travertine, which can be partially walked on, the installation, which appears as a wide space of red earth, is enlivened at regular intervals by rectangles of textiles with a finer weave but of the same colour as the material used in the garden. Here they achieve a cruder tonality in the comparison to the earth, creating a fascinating harmonic dissonance. 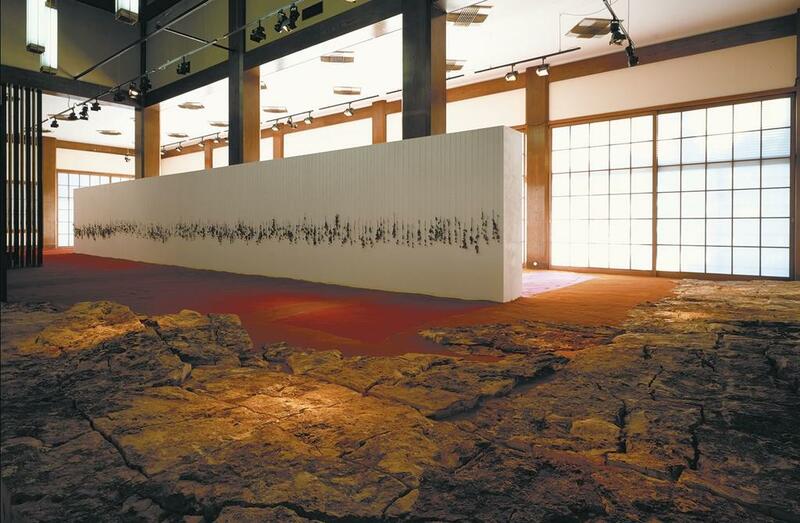 At the centre, the long white wall that crosses the exhibition space is divided by two rows of small dried roses, while the essence of peppermint seems to open the environment to the perfumes and the suggestion of a garden. 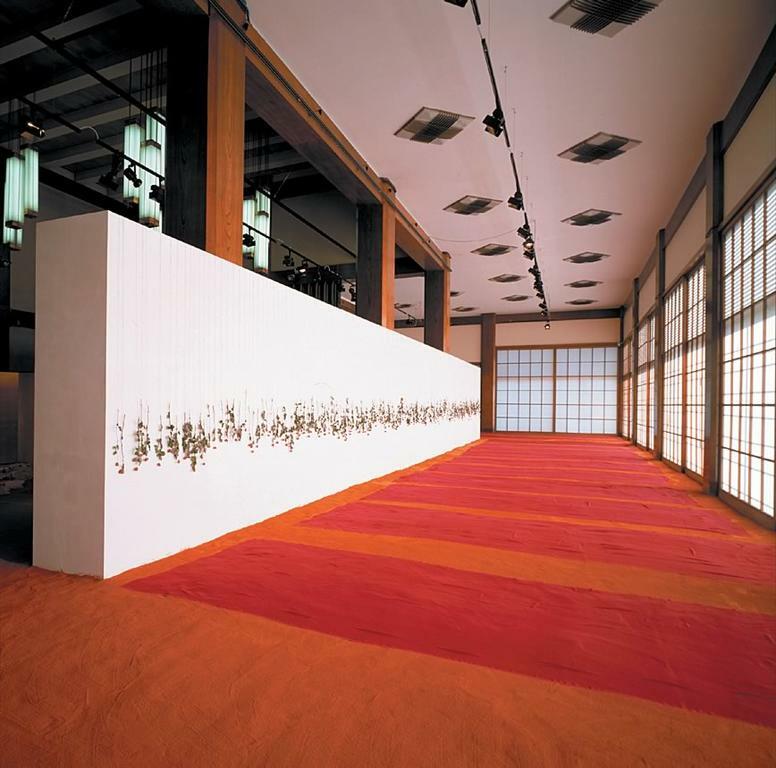 The meeting of Maria Dompè with the women of Nakiri took place during a trip in Japan in 1991 (see n. 9) and returns in the incursion in space as an intact emotion rediscovered in the memory: an emotion that unravels between the calm, suspended atmosphere of the interior and the mutability of the outer space, which is subject to the incessant play of the atmosphere and the vegetation.